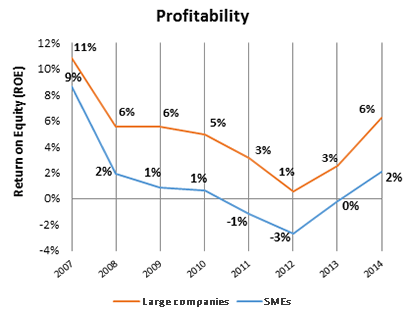 The crisis ravaged small and medium-sized enterprises (SMEs) in Spain. In fact, between 2007 and 2014, they lost competiveness compared with large corporations. While larger companies’ revenue levels remained steady, SMEs’ sales dropped 32 percent over the eight years analyzed. In terms of revenue-per-employee, SMEs saw this measure of productivity fall by 8 percent, as larger firms grew by 10 percent. Large companies’ average number of employees climbed by 7 percent, while smaller companies’ workforces were reduced by 27 percent. This is some of the data proffered by the “Back to Basics” Business Barometer (B4), which analyzed the financial statements of over a million companies in Spain during the crisis years of 2007 to 2014 to track trends. The first edition of the study, which will be updated annually, was designed and carried out by IESE professors Eric Weber and Miguel Ángel Ariño, along with Pedro Tort-Martorell, the head of Informa D&B, and Ricard Puigferrat, founder of Back To Basics Management. The study found that large companies in Spain perceive and react to changes more quickly, and are more agile and adaptable to market fluctuations. Meanwhile, Spanish SMEs lack the structure and resources to quickly change tack: they receive the full impact of any sudden market changes. Although Spanish companies’ net sales fell 16 percent from 2007 to 2014, the decline affected large and small firms very differently. The former managed to remain stable — in part because they acquired 10 percent of SMEs’ market share — while the latter watched as a third of their sales disappeared. Meanwhile, the return on equity (ROE) for big Spanish firms fell by 5 percentage points while it fell by 7 points for SMEs. The latter suffered losses (i.e., negative profitability after taxes) in 2011, 2012 and 2013. The results of the study also reflect a structural change in the Spanish economy: the transformation of small companies into larger structures so as to adapt better to changing economic conditions. In the period under study, 21 percent of jobs in Spain were lost, with a steeper decline in SMEs (27 percent, equivalent to 1.5 million people) compared with large companies (8 percent, or about 200,000 people). The size of the workforce climbed 7 percent, on average, for large corporations and fell 27 percent for SMEs, where revenue per employee declined 8 percent, compared to an increase of 10 percent in large firms. The average salary per employee failed to keep pace with the consumer price index, with annual growth of 1 percent for SMEs and 2 percent for large enterprises. The difference between the average salaries at large businesses and small grew from 10,000 euros in 2007 to 12,000 in 2014. Health care and the primary sector (agriculture, livestock and fishing) posted strong revenue growth, especially towards the end of the period studied. Sales growth was well above the national average, which fell 16 percent. Among the industries that suffered the most were manufacturing and mining. The tourism industry followed a pattern close to the average, although a few points higher, while construction and motor vehicles saw sales fall drastically. The construction industry’s revenues in 2014 were 67 percent lower than in 2007, which the study’s authors found “worrisome” because, as a traditional pillar of the Spanish economy, its problems affect other, dependent industries, too. 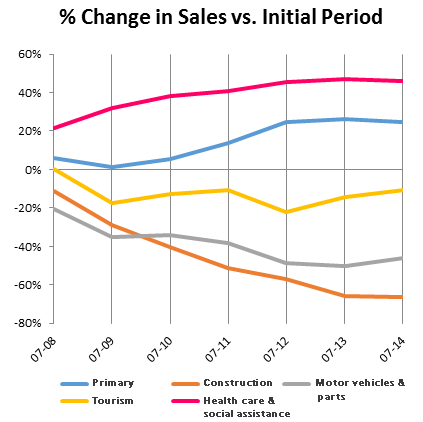 Meanwhile, the motor vehicles and parts industry declined from 2007 until 2013, with a drop in revenue of 37 percent. Although it recovered 5 percent in 2014, there is not enough data to tell if this was just a temporary recovery or an actual change in trend. The study found that one sector that should be built up in Spain is the health tourism sector, which brings together the potential of the tourism and health care industries. Conditions of instability and risk among its main competitors “should encourage this sector to move forward in a robust way,” the authors said. The only sector that did not lose jobs was the primary sector, with growth of 2 percent. The second-best-performing sector was the services industry, with a slim rise of 1 percent. Far behind were retail and manufacturing, which saw declines of 15 percent and 44 percent, respectively. The “Back to Basics” Business Barometer (B4) analyzed the financial statements of more 1.2 million companies between 2007 and 2014, using Informa D&B’s balance sheet analysis software and database (SABI). The analysis looked at business size, industry, region and time. The study’s main objective was to identify industries with the potential to lead the recovery. After all, the Spanish economy is clearly still in need of solutions.